The ASTM A420 WPL6 elbows mean the pipe elbows whose material is ASTM A420 grade WPL6.ASTM A420 is standard specification for piping fittings of wrought carbon steel and alloy steel for low-temperature service.The ASTM A420 WPL6 elbows are one kind of ASTM A420 WPL6 pipe fittings,and which are specially used in low temperature conditions. Size: Haihao Pipe Fitting Factory can manufacture the ASTM A420 WPL6 elbows from 1/2″ to 96″ or DN 15mm-DN 2400mm. Thickness: We supply the products in the nominal thickness,like SCH10S,SCH20,SCH40,SCH80,SCH120,SCH160,SCH-STD,SCH-XS,SCH-XXS. Ends: The ASTM A420 WPL6 elbows ends can be plain ends,bevel ends etc. Coating: We supply the products with black painted or others coating. 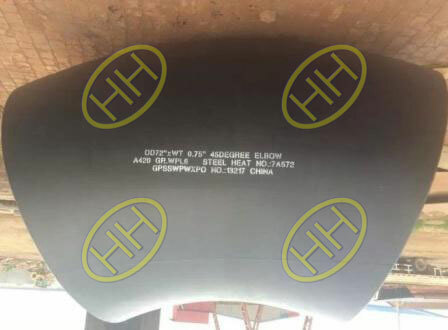 Standard: Haihao Group manufacture the ASTM A420 WPL6 elbows according to standard ASME/ANSI B16.5,B16.28,MSS SP-75,MSS SP-43. Application: Our products are widely used in industry field,like Oil & Gas,Power plant,Sea water treatment,Chemical-industry etc.